Data Loggers can monitor data via wire or wirelessly. Designed for factory, greenhouse, home, and building automation, DL-300 Series accurately measures and logs concentration of carbon dioxide, carbon monoxide, temperature, humidity, and dew point in air. Built-in alarm relay output can trigger alarms when concentrations are too high or too low. Loggers support both Modbus RTU/TCP and DCON protocol, enabling integration with other I/O and SCADA software. With Android and iOS app, users can monitor real-time air quality via smartphone. 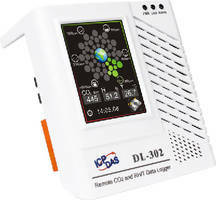 The DL-300 series are ICP DAS USA’s brand new product line that accurately measures and log concentration data of carbon dioxide (CO2), carbon monoxide (CO), temperature, humidity, and dew points in the air. It is designed for both industrial and consumer use for factory automation, greenhouse automation, home automation, and building automation. Data can be monitored via wire or wirelessly. With the free Android and iOS app developed by ICP DAS USA, users can also monitor the real time air quality on their smart phones. The module can be powered by Ethernet, so that it does not need power supplies. Temperature/CO/CO2 monitoring and control is very important in different areas such as warehouse, laboratories, food and beverage industries, as well as commercial and residential buildings. DL-300 has many functions that enable users to access data easily. It supports both Modbus RTU/TCP and DCON protocol, which makes it easy to integrate with other I/O and SCADA software. A simple SCADA station can collect data from each DL module and analyze data in the host PC in real time. For DL-302 and DL-303, NDIR sensor (Non-Dispersion Infrared) is built-in to ensure the most accurate measurement of carbon dioxide level. The CO2 molecules absorb light at 4.26um wavelength which is the range of Infrared. NDIR sensors can accurately detect the range of CO2 concentration. In addition, DL-300 modules are maintenance-free because of the built-in automatic baseline correction algorithm. Baseline correction algorithm can correct the CO2 level when it drops below the minimum concentration level. Users have the option to disable baseline correction if background CO2 concentration is high all the times such as at greenhouses, hospitals, and other 24-hour operation locations. DL-300 data loggers provide wide range of options to export data and monitor real-time data. It supports M2M and Internet of Things (IoT) MQTT protocol so that data can be viewed in multiple devices at the same time. DL-300 has Android and iOS apps that can be downloaded from Apple App Store and Google Play for free. The app can search for the DL-300 modules in the same network and connect to it. After that all real-time data will be displayed on the phone. Real-time data can also be seen on the build-in module screen. It contains graphic to show the exact concentration of CO/CO2 and the risk for human body. Temperature, humidity and dew point will also be displayed on the same screen. In addition, all configurations can be done through the touch screen without connecting to PC. The configuration includes Ethernet address setting, alarm, messages, date and time, and other data log setting. ICP DAS USA provides free DL-300 utility software for PC to easily configure the module, monitor real time data, and log and export data for analysis. DL-300 modules also have built-in alarm relay output that can trigger alarms when the concentration of CO/CO2/ Temperature/Humidity/Dew Point is too high or too low. User can enable/disable the alarm functions and set the specific level from utility or build-in touchscreen. When the alarm is activated, the alarm LED indicator on the front of the module will flash, build-in buzzer will sound. The relay output can be used to connect to external alarm light/sound and external devices. The alarm setting can also be configurated from utility. Utility can display the alarm log, data log. Data can be exported to excel spread sheet CSV file for analysis. If you have other monitoring requirements or have some questions, we can certainly help you to choose the best solution. Please call our technical support team at (310) 517-9888 x 102 or Email tech@icpdas-usa.com for more information.